Carbs fall in and out of fashion, depending on the fad diet of the moment. But carbs are an essential component of any healthy diet plan, and should be the main source of calories in your diet, because they are your primary source of energy. The key is to include healthy sources of carbs so that you get the greatest amount of nutrition from every bite. Most people get their carbs from starches. These types of carbs are considered complex carbs, which means they contain a string of sugars that are bonded together, and they tend to take longer to digest. There are a number of different types of foods that are considered starches. Grains are a starch and include foods such as rice, oats and anything made with wheat -- such as bread or pasta, quinoa and barley. Legumes, such as garbanzo beans, kidney beans, split peas and peanuts, are also starches. And, of course, a list of starchy vegetables will include vegetables such as potatoes, peas, corn and winter squash. Although the amount of carbohydrate will vary, in general, one serving -- such as a slice of whole-wheat bread or 1/2 cup of peas or beans -- has about 15 grams. Many of these carbs are also a source of fiber, which is a type of carbohydrate that's only partially digested by the body. Like complex carbs, fiber tends to slow down digestion. Fruits and vegetables are also a source of carbohydrates. Unlike starches, however, fruits and vegetables contain simple carbohydrates, which have one or two sugars bonded together; these simple carbs digest more quickly than complex carbs. Fruits, such as bananas, grapes, apples, cantaloupe and oranges, have more carbohydrates per serving than vegetables like broccoli, spinach, carrots, eggplant, mushrooms and kale. For example, a small apple has 15 grams of carbohydrates, but a 1/2-cup serving of steamed broccoli has 5 grams. Fruits and vegetables are also a source of fiber, as well as sources of vitamins and minerals. Like fruits and vegetables, milk is also a source of simple carbohydrates. This category not only includes milk, but also yogurt. A 1-cup serving of milk or a 3/4-cup serving of yogurt has 12 grams of carbohydrates. The amount of carbohydrates in milk does not change, whether you're drinking or eating the full-fat version or the fat-free version. Milk and yogurt are also good sources of high-quality protein and calcium. Sweets are also a source of carbohydrate, and include sugar, honey, soda, candy, cake, cookies, doughnuts, ice cream and other confections. Sweets contain simple carbohydrates or sugars. 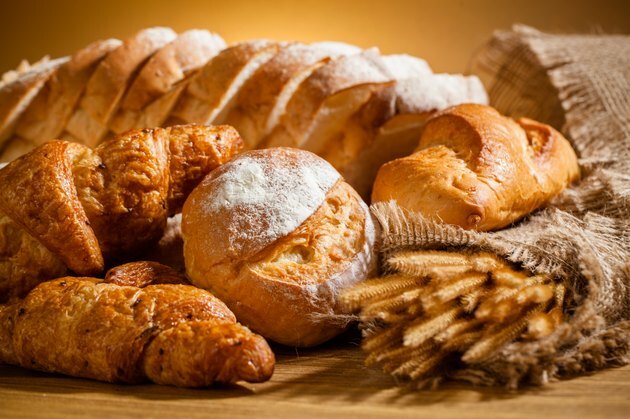 Although refined-carbohydrate foods -- such as white bread, white rice and white pasta -- are made up of complex carbs, they are still processed foods. Sweets and refined carbs are not as nutritious as starches, fruits and vegetables. They lack fiber and are not a natural source of vitamins and minerals. MedlinePlus notes that it is always healthier to get your vitamins and minerals from natural sources, such as 100 percent whole-wheat bread or whole-grain oatmeal, than from enriched sources.